The Amtrak® Pacific Surfliner® announced the first-ever Surfliner Series as the Los Angeles Angels of Anaheim face the San Diego Padres at Petco Park for a series of three interleague games on August 13, 14 and 15, 2018. Fans can take advantage of special offers and promotions to save on both train travel and ballpark tickets, as well as enter for a chance to win the Grand Slam Giveaway, where one lucky winner will get to throw out the first pitch at Petco Park on August 14 prior to the Angels-Padres game. Save 20% on Padres game tickets: Visit padres.com/surflinerpartnertickets, click "Buy Tickets" and enter promo code "PACIFICSURFLINER2018" to access special savings on Padres game tickets, including Surfliner Series games. Save 15% or more on train travel: Seniors, students and passengers with disabilities save 15% on train travel with California Everyday Discounts. Kids (ages 2-12) ride half-price with a paid adult. Ages 2 and younger ride free. Visit pacificsurfliner.com/surflinerseries to enter to win one of two prize packages including round-trip Pacific Surfliner tickets in Business Class, a one-night hotel stay at the San Diego Marriott® Gaslamp Quarter and Surfliner Series game tickets. One Grand Slam winner will also receive the opportunity to throw out the first pitch before the game on August 14. Winners will be announced on August 7, 2018. Santa Fe Depot in downtown San Diego is the southernmost stop on the Pacific Surfliner route. Petco Park is a few trolley stops away, or an easy 25-minute walk. The FOX Sports Fan Express will operate special shuttles from the Santa Fe Depot to Petco Park during the Surfliner Series August 13 – 15 starting at 3:30 p.m., operating every 30 minutes until game time. The Amtrak Pacific Surfliner offers daily service between San Diego, Orange County, Los Angeles, Ventura, Santa Barbara, and San Luis Obispo, connecting travelers to popular destinations along the Southern California coast. Visit pacificsurfliner.com/surflinerseries to view complete details on the Surfliner Series including game schedules, discount fares and sweepstakes information. To stay up to date on the latest announcements, breaking news, and information for Amtrak Pacific Surfliner visit news.pacificsurfliner.com/. We have had a few friends take the train down to the baseball games and I always hear them rave about it. The experience looks to be amazing. I hope to take my fambam on a trip soon. Tips for me on Surfliner travel? 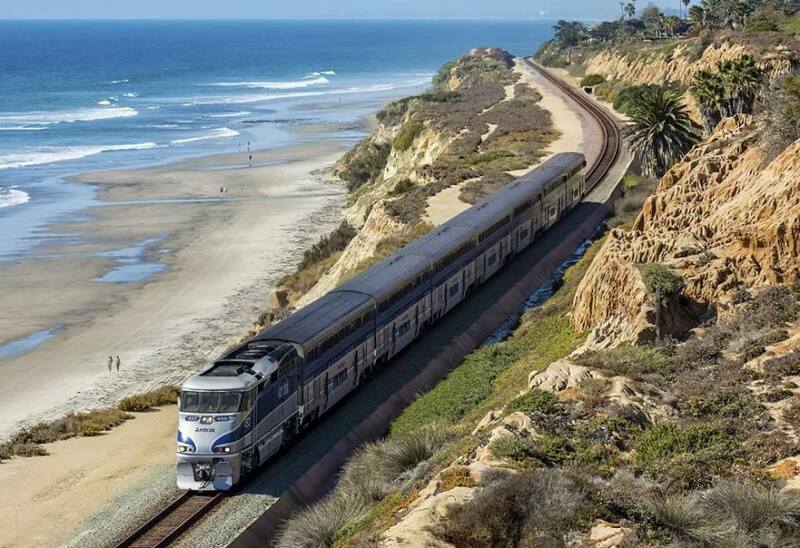 Favorite places to take the Surfliner to? Drop it in the comments below!